Eating a healthy breakfast is really worth the few minutes it takes to prepare. This scrumptious hot breakfast cereal puts two delicious ‘superfoods’ together; creating a dish that is as tasty as it is healthy! Oatmeal is a good source of vitamins, minerals, antioxidants, protein, complex carbohydrates and iron. Research shows that is can help you lose weight, reduce cholesterol and fight disease. Blueberries are packed with powerful phenolic antioxidants, which research shows works to reduce oxidative stress and inflammation – thought to be a major contributor to disease. 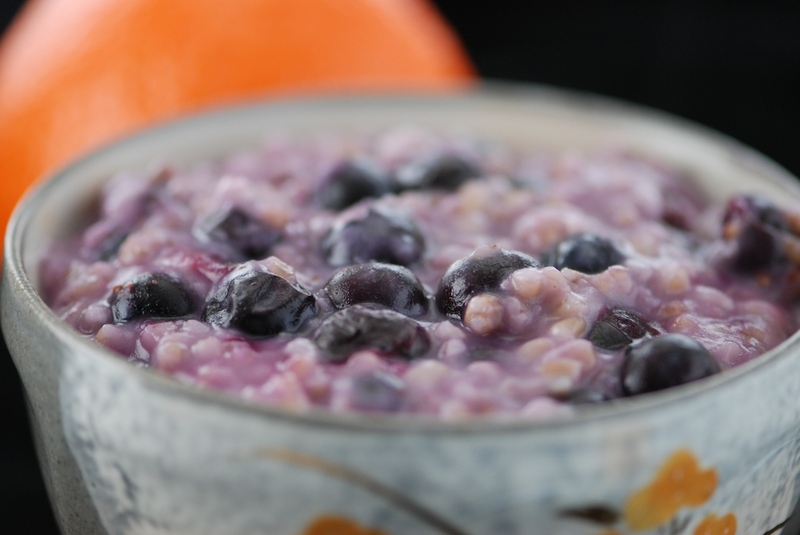 Combine oats, water, salt and half of the blueberries in a pot, bring to a simmer and cook for about 5 minutes – stirring regularly. Add sugar to taste. Add remaining berries, remove from heat and rest for 1 minute. Serve immediately. Tip: make extra, place in bowls allowing room for stirring, cover and refrigerate for breakfast later in the week. Heat in the microwave with a splash of milk or soymilk. Variation 1: McCann’s Steel Cut Oats are a real upgrade to rolled oats! They offer a nutty texture, but do require more cooking time. If using, add half the berries for the last five minutes of cooking and the remaining berries at the very end of cooking. To speed cooking time, use the overnight soak method on the can. Variation 2: Substitute fresh blueberries with a large handful of dried cranberries or a medley of dried fruits such as Tony’s Very Berry Medley. Add the dried berries at the beginning of cooking. Great finished with a sprinkle of sliced almonds.